Congratulations to my students Sophie, Anum, Eliz, Shelley and Shradha! This fourth year ENBUS 402 project group, Aveneer, has been selected as a one of three CSA Group National Academic Challenge finalists for the 2014 Annual Conference in Charlottetown, PEI. The group’s submission, The Value of ISO Environmental Management Standards to Organizations in Canada, was selected by judges. 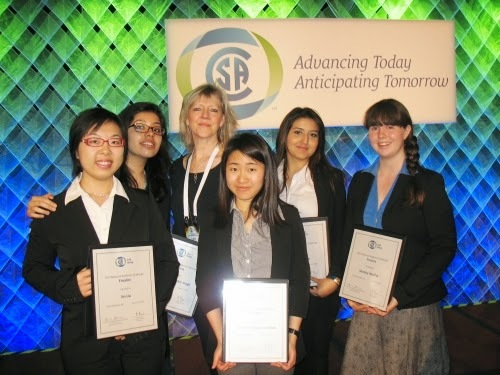 All five women are invited to the CSA Group annual conference to present their work in the final competition. The CSA Group is paying for flight/travel and accommodation arrangements for the group, where they will be making presentations and participating in a variety of Annual Conference activities. Much thanks to Lynn Johannson and Vanessa Mitchell, co-advisors.